Cytosolic phospholipases A2 hydrolyse arachidonyl phospholipids. Family includes phospholipases B isoforms. This family consists of lysophospholipase / phospholipase B EC 3.1.1.5 and cytosolic phospholipase A2 which also has a C2 domain IPR000008. Phospholipase B enzymes catalyse the release of fatty acids from lysophsopholipids and are capable in vitro of hydrolyzing all phospholipids extractable from yeast cells [(PUBMED:8027085)]. Cytosolic phospholipase A2 associates with natural membranes in response to physiological increases in Ca2+ and selectively hydrolyses arachidonyl phospholipids [(PUBMED:8051052)], the aligned region corresponds the carboxy-terminal Ca2+-independent catalytic domain of the protein as discussed in [(PUBMED:8051052)]. There are 4116 PLAc domains in 4116 proteins in SMART's nrdb database. Taxonomic distribution of proteins containing PLAc domain. This tree includes only several representative species. The complete taxonomic breakdown of all proteins with PLAc domain is also avaliable. Click on the protein counts, or double click on taxonomic names to display all proteins containing PLAc domain in the selected taxonomic class. Function and inhibition of intracellular calcium-independent phospholipase A2. Structure, function and regulation of Ca2+-sensitive cytosolic phospholipase A2 (cPLA2). The 85-kDa cytosolic PLA2 (cPLA2) is present in many cells and tissues and its unusual functional properties and catalytic mechanism are being elucidated. Notably, cPLA2 becomes catalytically active in the presence of free Ca2+ concentrations as present in stimulated cells and preferentially cleaves arachidonic acid-containing phospholipids. A variety of agonists, growth factors and cytokines, as well as stressful stimuli activate cPLA2 to hydrolyze cellular phospholipids thereby liberating fatty acids and lysophospholipids and providing the precursor substrates for the biosynthesis of eicosanoids and platelet-activating factor. These products of cPLA2 contribute to inflammatory and degenerative disease states and cPLA2 is therefore an attractive target for the development of novel therapies. Properties and regulation of cytosolic phospholipase A2. Identification of essential residues for the catalytic function of 85-kDa cytosolic phospholipase A2. Probing the role of histidine, aspartic acid, cysteine, and arginine. Cytosolic phospholipase A2 (cPLA2) hydrolyzes the sn-2-acyl ester bond of phospholipids and shows a preference for arachidonic acid-containing substrates. We found previously that Ser-228 is essential for enzyme activity and is likely to function as a nucleophile in the catalytic center of the enzyme (Sharp, J. D., White, D. L., Chiou, X. G., Goodson, T., Gamboa, G. C., McClure, D., Burgett, S., Hoskins, J., Skatrud, P. L., Sportsman, J. R., Becker, G. W., Kang, L. H., Roberts, E. F., and Kramer, R. M.(1991) J. Biol. Chem. 266, 14850-14853). cPLA2 contains a catalytic aspartic acid motif common to the subtilisin family of serine proteases. Substitution within this motif of Ala for Asp-549 completely inactivated the enzyme, and substitutions with either glutamic acid or asparagine reduced activity 2000- and 300-fold, respectively. Additionally, using mutants with cysteine replaced by alanine, we found that Cys-331 is responsible for the enzyme's sensitivity to N-ethylmaleimide. Surprisingly, substituting alanine for any of the 19 histidines did not produce inactive enzyme, demonstrating that a classical serine-histidine-aspartate mechanism does not operate in this hydrolase. We found that substituting alanine or histidine for Arg-200 did produce inactive enzyme, while substituting lysine reduced activity 200-fold. Results obtained with the lysine mutant (R200K) and a coumarin ester substrate suggest no specific interaction between Arg-200 and the phosphoryl group of the phospholipid substrate. Arg-200, Ser-228, and Asp-549 are conserved in cPLA2 from six species and also in four nonmammalian phospholipase B enzymes. 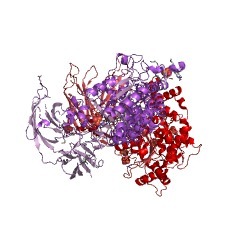 Our results, supported by circular dichroism, provide evidence that Asp-549 and Arg-200 are critical to the enzyme's function and suggest that the cPLA2 catalytic center is novel. Delineation of two functionally distinct domains of cytosolic phospholipase A2, a regulatory Ca(2+)-dependent lipid-binding domain and a Ca(2+)-independent catalytic domain. Cytosolic phospholipase A2 (cPLA2) associates with natural membranes in response to physiological increases in Ca2+, resulting in the selective hydrolysis of arachidonyl phospholipids. The isolation and sequence analysis of cPLA2 cDNA clones from four different species revealed several highly conserved regions. The NH2-terminal conserved region is homologous to several other Ca(2+)-dependent lipid-binding proteins. 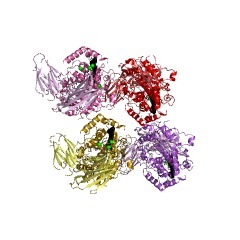 Here we report that the first 178 residues of cPLA2, containing the homologous Ca(2+)-dependent lipid-binding (CaLB) motif, and another recombinant protein containing the cPLA2(1-178) fragment placed at the COOH terminus of the maltose-binding protein (MBP-CaLB) associate with membranes in a Ca(2+)-dependent manner. cPLA2 and MBP-CaLB also bind to synthetic liposomes at physiological Ca2+ concentrations, demonstrating that accessory proteins are not required. In contrast, delta C2, a truncated cPLA2 lacking the CaLB domain, fails to associate with membranes and fails to hydrolyze liposomal substrates. However, both delta C2 and cPLA2 hydrolyze monomeric 1-palmitoyl-2-lysophosphatidylcholine at identical rates in a Ca(2+)-independent fashion. These results delineate two functionally distinct domains of cPLA2, the Ca(2+)-independent catalytic domain, and the regulatory CaLB domain that presents the catalytic domain to the membrane in response to elevated Ca2+. Structure of porcine pancreatic phospholipase A2 at 2.6 A resolution and comparison with bovine phospholipase A2. 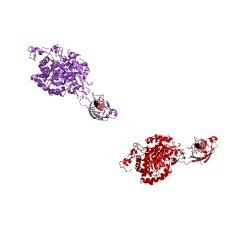 The previously published three-dimensional structure of porcine pancreatic prophospholipase A2 at 3 A resolution was found to be incompatible with the structures of bovine phospholipase A2 and bovine prophospholipase A2. This was unexpected because of the very homologous amino acid sequences of these enzymes. 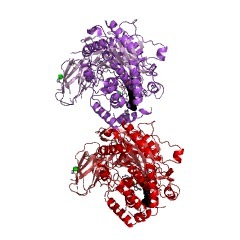 Therefore, the crystal structure of the porcine enzyme was redetermined using molecular replacement methods with bovine phospholipase as the parent model. The structure was crystallographically refined at 2.6 A resolution by fast Fourier transform and restrained least-squares procedures to an R-factor of 0.241. The crystals appeared to contain phospholipase A2 and not prophospholipase A2. Apparently the protein is slowly converted under the crystallization conditions employed. Our investigation shows that, in contrast to the previous report, the three-dimensional structure of porcine phospholipase A2 is very similar to that of bovine phospholipase A2, including the active site. Smaller differences were observed in some residues involved in the binding of aggregated substrates. However, an appreciable conformational difference is in the loop 59 to 70, where a single substitution at position 63 (bovine Val leads to porcine Phe) causes a complete rearrangement of the peptide chain. In addition to the calcium ion in the active site, a second calcium ion is present in the crystals; this is located on a crystallographic 2-fold axis and stabilizes the interaction between two neighbouring molecules. This information is based on mapping of SMART genomic protein database to KEGG orthologous groups. Percentage points are related to the number of proteins with PLAc domain which could be assigned to a KEGG orthologous group, and not all proteins containing PLAc domain. Please note that proteins can be included in multiple pathways, ie. the numbers above will not always add up to 100%.